BPM Labs The One is a powerful, high stim, extreme energy pre-workout formulation. BPM Labs The One has replaced Pouchong Tea extract (AMP citrate equivalent) to Higenamine (safe & legal alternative). Strong focus enhancer to help you hit exercise after exercise without being hampered with fatigue. Designed for advanced trainers tackling, harder and tougher workouts. After being reformulated now known as BPM Labs The One, the product promises just as much energy and intensity as the previous version The One 2.0, even though it has been reformulated. Is there much difference? Let's take a look at this review. Although The One 2.0 contains some similar ingredients to its ancestor, including beta alanine, creatine monohydrate, arginine malate, creatine malate, creatine ethyl ester, caffeine, arginine AKG, niacin, and naringen, the real meat of the product is completely different. This includes stimulants such as Pouchong tea extract (AMP citrate), cacao plant extract (source of caffeine and theobromine), and Nandina domestica (source of higenamine), and bitter orange extract (source of synephrine). Fans of the original The One 2.0 will notice from the very first serve that The One is a completely different breed of animal. This does not mean that it is any less strong, but rather, it is a product that provides a dissimilar sensory experience. At first, you feel the beta alanine tingles, but then everything else is different from there on. Instead of the euphoric high from the original formulation, you feel a surge of energy not too unlike to products like the original Jack3d. Focus and energy are definitely highlights of this product, with pump taking a backseat. With ingredients like caffeine and theobromineThe One does not appear to be too different from run of the mill pre workouts. However, what really sets it apart is the replacement of Pouchong Tea Extract, with Higenamine which is an ingredient that has really taken off lately in popularity for its similarities to the now banned AMP Citrate. Much like its predecessor, The One is still very much at the top of the spectrum for strong pre workouts and is safe to use. The One was never best known for pumps and nitric oxide boosting effects. This characteristic is also carried across into the new formulation, as there were really no changes in the pump component of the product. In our opinion, this was a missed opportunity, as BPM could have easily switched out the old-school arginine for the more effective citrulline and agmatine based ingredients. As such, if you prefer a pump product to a stim product, The One may not be for you. Another criticism for The One is its use of its proprietary blend. There is definitely ample room in a 13.5 g serve, to give you a good buzz. However, it is unlikely to contain enough creatine, beta alanine, and arginine to give you benefits from those ingredients. The One is only available in three flavours - green apple, watermelon and pineapple. When first opening The One, you would be surprised how pleasant it smells. However, taste is not its forte as the bitterness of the raw ingredients used in The One are particularly difficult to mask. After the initial bitter taste, a lingering sweet aftertaste will persist for a few minutes. Mixability though, is excellent and effortless. 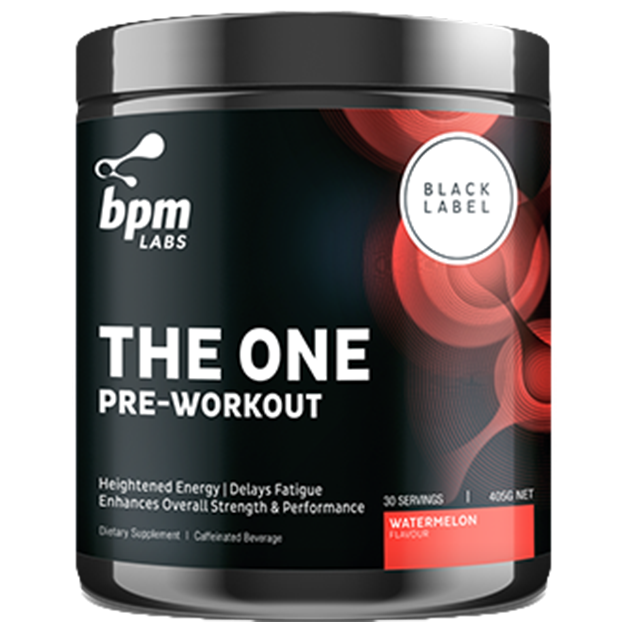 Much like its predecessor, BPM Labs The One is one of the strongest pre workouts available in regards to the amount of energy it provides. Although it may not be one of the most pumptastic or delicious pre workouts, we have confidence that BPM Labs fans will not be disappointed with this brand new formulation.